This week, our free MFT exam practice question is going to focus on the topic of substance use. This is a subject that will likely appear on your exam since substance use and substance abuse issues are rather prevalent in our society. Furthermore, they usually go hand in hand with mental health struggles clients experience, since many tend to self-medicate using various substances. 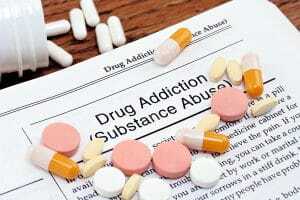 The licensing board wants to make sure that all of us are aware of what to look for and what to do in case substance use conditions are present. Regardless of how much or how little you already know about this subject, the Therapist Development Center’s exam prep, will ensure you know everything you need to correctly answer questions on this topic. How might this topic be tested? Let’s see how you do on this week’s FREE MFT practice question. A therapist working at a community mental health agency is meeting with a 43-year-old Caucasian male. The client reports he is unemployed and can only afford treatment with a sliding scale. In addition, he shares a history of traumatic abuse and loss, both in his childhood and young adult years. During the initial interview, the therapist notices that client appears to have a runny nose, dilated pupils and his mood appears to be dysphoric. The client complains that he is feverish and his muscles are aching. Based on the presenting picture, what interventions should the therapist consider? Physical symptoms described in the stem are a better fit for the opioid withdrawal, not amphetamine withdrawal. Thus, answer A is not a good fit. Answer B is correct, since the symptoms the client is experiencing point to an opioid withdrawal. If this is what the client is going through, the immediate action to take would be to refer him to a detox facility. Answer C is incorrect, since we have determined that the client is likely going through an opioid withdrawal. A detox facility would be a better referral than an intensive outpatient in this case, since opioid withdrawal can be dangerous and should be done under supervision. Intensive outpatient treatment facilities focus more on long-term recovery, which would be an important step, but only after a detox facility. Answer D correctly identifies an opioid withdrawal problem; however, as noted above, a detox facility would be a better referral than an intensive outpatient in this case. To learn all about the intricacies of taking substance use into consideration, sign up for one of TDC’s MFT exam study guides to help you prepare for your exam today! Amanda Rowan has helped thousands of Marriage and Family Therapists pass their MFT exams-are you our next success story?